The followers of James J. Strang have been known as Strangites. James J. Strang claimed to have been ordained under the hands of angels the same hour of Joseph Smith’s death on June 27, 1844 (although 400 miles away). Joseph Smith’s last revelation was a Letter of Appointment written on June 18th, and received by regular course of mail in Burlington, Wisconsin on July 9th, designating James as his successor. James was murdered in 1856, his followers were scattered, and there was no successor. A valid claim to the Melchisedec Priesthood has continued through the true followers of James J. Strang. It should be noted that the use of the term Strangite has only been used because of its common use. The saints are not Strangites. Throughout the Bible the followers of God have been known as “sons of God,” as “saints,” and other such terms. They were first called Christians in Antioch in derision against them. After the translation of the Book of Mormon, they were called Mormons. We do not object to the use the terms “Mormon” and “Strangite;” but it should be noted that we are “known” as Strangites and not that we are Strangites. We are not “Mormons;” although we believe the Book of Mormon to be another testimony of Jesus Christ. It provides support to the validity of the Bible. We prefer to be known either as Christians or as Latter Day Saints. The martyrdom of Joseph Smith on June 27, 1844 , caused a division in the church. The name of each church has been identified by the leader of that organization. Shortly after the murder of Joseph Smith, three separate organizations were formed. These were termed the “Rigdonites,” the “Twelvites” (later Brighamites), and the original Strangites. Some of the later organizations was that led by Joseph Smith, III in 1860–known as the Reorganized Church; and the corporate Strangites organized in 1961. Various other organizations were formed in the years following Joseph’s death. None of these were led by one either appointed by Joseph Smith, or ordained according to the law of God. The original church under Joseph Smith and the other three organizations noted above will be discussed. This will be followed by an examination of the organization of the Strangites after the death of James, and the division of the Strangites in 1961. This site is maintained by Elder Samuel E. West who is a member of the original unincorporated church. What is popularly known as the Mormon Church was originally organized on April 6, 1830, by Joseph Smith; as the Church of Christ . It was later named the Church of Jesus Christ of Latter Day Saints. The original church was organized as an unincorporated religious society. Many churches of the day organized as a corporation. This is not possible for the Church of Christ. Of course the church exists as a civil organization; but through its direct association with God is also a spiritual entity. The civil aspect of the church has been incorporated to hold property; but, the spiritual church was never incorporated until 1961, under the leadership of Vernon Swift. Incorporating the spiritual church would change the identity of the church into a fictitious function of the United States Government. The Church of Christ is identified by its organization. Jesus organized the church with a pattern that was to last, “Till we all come in the unity of the faith.” “And he gave some, apostles; and some, prophets; and some, evangelists [High Priests]; and some, pastors [Elders] and teachers.” (Eph. 4:11) Take away the head and the body dies. The Church of Christ exists only as long as this organization exists. Dozens of articles in official church journals have stated the Church of Christ always has a Prophet at its head. 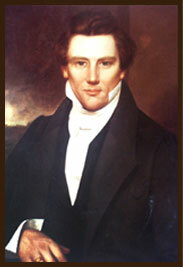 The original Church of Christ organized by Joseph Smith was lost at the death of James J. Strang. The highest office remaining in the church was that of third degree Apostle. Revelations and commandments from God was severed. Joseph Smith was ordained a first degree Apostle—Prophet, Lawgiver, Seer, Revelator and Translator. Others were ordained second degree Apostles—Prophets, Counselors, and Seers. Sidney Rigdon was one of these. At the death of a Lawgiver, when another is not appointed by God, the only other officer that can stand at the head of the Church of Christ is a second degree Apostle (Book of the Law, p. 219)—who is also a Prophet; but not a Lawgiver. The Twelve were third degree Apostles; and subject to these higher authorities. These twelve Apostles can act with royal (presiding) authority only under the direction of the Presidency. “The Twelve are a Traveling Presiding High Council, to officiate in the name of the Lord, under the direction of the Presidency of the Church, agreeable to the institution of heaven; to build up the church, and regulate all the affairs of the same in all nations, first unto the Gentiles and secondly unto the Jews.” (Doctrine and Covenants, 107:33) Their fundamental mission was not to Zion; but to the nations of the world. The ordination of Brigham Young made this obvious. “The blessing of Brigham Young was as follows, that he should be strong in body, that he may go forth and gather the Elect preparatory to the great day of the coming of the Lord, and that he might be strong and mighty, declaring the tidings to nations that know not God, that he may add ten talents, that he may come to Zion with many sheaves.” (Kirtland Council Minute Book, p. 72) Note that he was not ordained a Prophet. The blessings and ordinations remain only as long as a person is faithful and obedient. Sidney Rigdon would have had a just claim to presiding over the Church of Christ had James J. Strang not been ordained as a first degree Apostle and Lawgiver–above him in authority. Brigham Young had absolutely no claim as President of the church; as he was only a third degree Apostle. He was never called and ordained by God as a Prophet. The last Apostle, L. D. Hickey, ordained High Priests with evangelical duties in accordance with the law. With legitimate evangelical offices of the Melchisedec Priesthood remaining among the remnant of the Strangites, the entrance to the kingdom of heaven remained open. Even though most still use the name Church of Jesus Christ of Latter Day Saints, the church cannot be the spiritual Church of Christ. A more proper name would be the Church of the Latter Day Saints (as used in the title page of the 1835 Doctrine and Covenants). Those who have remained faithful and obedient remain as members of the Kingdom of God and members of the Church of the Firstborn. It is my understanding that the Brighamite church elected to change its identity by becoming a corporation. As a church of man, whatever previous claims might have been made, it could no longer be claimed to be the Church of Christ. A group of the Strangites made the same error in 1961. That group, led by Vernon D. Swift, with headquarters in Artesia , New Mexico, gave up their original identity as a church of God and became a church of man; existing and subservient to the laws of man. Their Certificate of Incorporation actually declared that “it has absolutely no connection, ties, agency or affiliation with any other religious society;” including the original church organized by Joseph Smith and continued through James J. Strang. The first group that was organized after the death of Joseph Smith was led by James J. Strang. This group has often been termed Strangites; although the proper name is the Church of the Latter Day Saints. Joseph Smith had given four revelations from God stating that in the event of his impending death that he would appoint “another” (singular) as his legal successor. At the very hour of his death, some 400 miles away, James claimed to have been ordained under the hands of angels—in accordance with the law of God given through Joseph. “For verily I say unto you, that he that is ordained of me shall come in at the gate and be ordained as I have told you before, to teach those revelations which you have received and shall receive through him whom I have appointed.” (Doctrine and Covenants, 43:7) James had to be ordained the same as Joseph to hold the same office as Joseph. Consider what an unusual claim this was for James to declare, in effect, that Joseph was dead. James could only stand in Joseph’s stead, if Joseph had died. The “Letter of Appointment” from Joseph to James, naming him as Joseph’s legal successor, was written on June 18, mailed in Nauvoo on June 19, received in Burlington, Wisconsin on July 9, 1844 , and remains in Yale University Library. This was the first official news of the death of Joseph in Burlington. Under command of God, James established Voree (near Burlington) as a stake of Zion. The people were given several direct commandments. They were to gather. They were to have all things in common. They were to build a Tower Of Strength. They were to build a Tabernacle for God. They failed. The gathering of the saints was moved by God to Beaver Island. The people no longer enjoyed the peace they had in Voree. They continued in their failure to live by the laws and commandments of God and James was taken; as Joseph had been before. This second group of Mormons was organized after the death of Joseph by Sidney Rigdon. Rigdon had been a Vice-President and Counselor to Joseph. His claim to standing at the head of the people would have been legitimate had James not been called of God and ordained to a superior office; as Joseph’s successor. James J. Strang and his followers extensively labored with Rigdon; encouraging him to take his place in the original church organization that was continued through James. He refused. At a conference on October 19, 1846, James received a revelation in which God declared, “Therefore he shall not stand in his presidency for I do take his office from him and give it unto one who will serve me.” George J. Adams was called in his place. On August 15, 1844 , Brigham Young, President of the Twelve, announced, “Let no man presume for a moment that his [Joseph’s] place will be filled by another.” He announced that the Twelve would “Preside over all the affairs of the church in all the world.” (Times and Seasons, Vol. 5, p. 618) Thus they were called “the Twelveites.” The law of God provides that the Twelve had no jurisdiction in Zion. Their mission was to the nations of the world. Brigham Young refused and was tried by a proper tribunal of the High Council on April 7, 1846. Charges included “Conspiracy to overthrow the order of the Church, “Usurpation,” “Tyrannous Administration,” “Teaching False Doctrine,” and “Blasphemy;” with accompanying accusations. At a conference called by Brigham and held on Dec. 24, 1847, it was acknowledge that the Brighamite church was in an “unorganized state;” and that “they had to select a First Presidency.” This they accomplished through a vote of the people. “It was moved and seconded that Brigham Young should be our First President. It was carried unanimously.” From this time they became known as the Brighamites. Brigham introduced a new doctrine on the existence and character of God. He taught that God was once a man, progressed to His current level of deity, and that man can do the same. He even taught that Adam was God. Since his new doctrine was opposed to the teachings of Joseph, he simply removed Part One from his Doctrine and Covenants. The Reorganized Church of Jesus Christ of Latter Day Saints was begun in Beloit , Wisconsin, by two apostate Strangites in 1852. It was not until 1860 that Joseph Smith III, the son of Joseph Smith the Prophet, accepted leadership of this group. In a tract called The Prophetic Office, written by Edward T. Couch in September, 1908, he wrote the following concerning this group: “We will first take up the claims of the present head of the Reorganized Church. He was about twelve years old when his father, the great Prophet was killed. He did not, nor any one in his behalf, make any claim to be his father’s successor for several years after this sad event. About the year 1856 to 186o, Jason W. Briggs and Zenos H. Gurley came to Joseph and wanted him to take up the claim to be his father’s successor in the prophetic office. The following is his reply as given by himself: ‘Will I ever have anything to do with Mormonism? If so, how and what will it be?’ These words are quoted from ‘Life of Joseph the Prophet,’ page 757, a book that is printed and sold by the Reorganized Church, and of course they are willing to take evidence on the question before us from their own publications. “Once more Joseph tells us, ‘I believed that He who enabled my father to decide… could enable me, if He would, to decide whether I should, or should not, have anything to do with Mormonism; and if so, what?’–Page 762. “This makes four testimonies quoted from ‘Life of Joseph the Prophet,’ in which the present Joseph up to this time, made no claim to be his father’s successor. From the fact that Joseph was at this time about 26 years old, ‘and did not know then that he ever would have anything to do with Mormonism,’ it shows conclusively that he was neither appointed, nor ordained by his father. “We will now call your attention to what the President of the Reorganized Church said of his father about twenty-three years after this. It is this: ‘He [his father] could not ordain and induct a successor while himself lived.’–Young Joseph’s letter to J. B. Price, in the Saints Advocate of Sep., 1883, vol. 6. Joseph was right in this; his father could not ordain and induct a successor while he lived, or there would be two heads to the church at the same time. This makes the fifth statement in which he disowns any ordination by his father to the prophetic office. “Now let us see what Elder Whitehead of the Reorganized Church has told us. He said, ‘he saw Newell K. Whitney, Hiram Smith, and Joseph Smith anoint and ordain Young Joseph a prophet, seer and revelator in 1844, in a room over Joseph’s store in Nauvoo.”–Saints Herald, June 27, 1885 , page 413. This statement is also in the Josephite tract, No. 17, called ‘The Successor,’ page 9. This tract was circulated about fifteen years ago. It is also put on record in ‘True Succession In Church Presidency,’ by Elder Heman C. Smith, page 47. It is very easy to see that this Whitehead testimony says, Joseph Smith, his brother Hiram, and Newell K. Whitney anointed and ordained Young Joseph a Prophet, Seer, and Revelator. It is also very easy to see that this one statement contradicts the five made by his own Prophet and President, as already shown; so this makes five contradictions. In 1985, the Reorganized Church changed their organization and name, became ecumenical, and affiliated itself with the National Council of Churches (NCC) and the World Council of Churches (WCC). Their new name is the Community of Christ. Richard Price continued to maintain a group with the same name, identity, and doctrines of the original church. Some of the Apostles made an attempt to organize the church. Their conclusion was that as third degree Apostles none was authorized by God to stand at the head of the church. Apostle Post wrote, “There were five of the Apostles, that met together (viz) L. D. Hickey, L. D. Tubbs, J Pearce, J. Hutchins, & W. Post on the 10th of Feb. 1857, in the wilderness 6 miles from Racine, and there prayed and communed with each other all night. We became satisfied, that the Twelve could not lead the Church without a Prophet; and concluded to take care of ourselves & families; and when occasion offered; minister to the necessities of the Saints, according to our abilities, until we have the word of the Lord to guide us on to other duties. This is truly a time of mourning, & fasting; for God has chastened us sorely for our sins, & we know not the extent of our sins, for God has not shown them unto us. D. Hickey was the last of the Twelve; and had been at the 1857 meeting of the Apostles. He died onApril 25, 1897. All of the Apostles understood that the church was not organized without a Prophet; and that none could stand at the head. It is contrary to the laws of God for any person—other than members of the Presidency—to attempt to govern and regulate the church independently without the supervision of the Presidency. The Twelve under Joseph were rebuked for making such an attempt. James taught, “I am aware also that the Twelve claim in their first Apostolic letter after the death of Joseph to preside over and dictate all the affairs of the Church in all the world. Some time around 1910, Watson wrote two licenses in which he identified himself as being ordained a Presiding High Priest by L. D. Hickey. One was dated in Coldwater, Michigan, on May 21, 1901, signed L. D. Hickey and John Wake (the book in which it was written was published in 1908). The second certificate was dated Feb. 1, 1910, signed L. D. Hickey and Warren Post. Both certificates are in Wingfield Watson’s own handwriting. As L. D. Hickey held no authority above that of third degree Apostle, he could not ordain Watson a Presiding High Priest. He could only ordain him a High Priest with evangelical duties. The difference is that an evangelical High Priest only holds authority, as explained by Watson, to preach the gospel and administer its ordinances. “Besides the office of apostle there is also the office of High Priest and Elder, who holds the right to preach the gospel and administer its ordinances.” They hold no royal or presiding authority. This resolution was contrary to the law of God and the proper organization of the priesthood. It was soon discarded. The people still sought to put a head on the church. In 1925, a conference made such a resolution. “Resolved that we sustain and uphold Elder S. H. Martin as Presiding High Priest over the church and conference by our faith, confidence and prayers.” For sixty-nine years after the death of James, the church had no head; and could not have a head without one being appointed by direct revelation. A Presiding High Priest over the church would be the President of the church. At a High Council meeting on January 15, 1836 , “Don Carlos Smith was nominated to the president of the High Priesthood in Kirtland.” He was called by the High Council; and ordained by those standing above him in royal authority: President Joseph Smith, Sr. and Sidney Rigdon. He was properly called and ordained according to the law of God. The presumed ordination of Samuel Martin, an evangelical High Priest, as President (Presiding High Priest) over the church began a new tradition. Samuel Martin ordained Moroni Flanders and Lloyd Flanders evangelical High Priests on Feb. 26, 1926 . A conference in 1928, noted that “Max ( Moroni ) Flanders was set apart by ordination as an assistant presiding High Priest to assist Presiding High Priest S. H. Martin in the work of the church and to take charge of the work at his decease.” This is only compounding the problem. There is no office of Assistant Presiding High Priest in the order of the house of God. At best, this could only be a blessing to help Max Flanders in his spiritual work after the death of Martin. It could not bestow upon him any ruling power over the church. Whatever chain of authority might have been claimed from 1926 to 1947, was severed by the lack of one holding proper authority to ordain Lloyd Flanders; and the precedent that the voice of the people cannot take the place of being “called of God, as was Aaron.” At a conference in 1955, a teacher “nominated Bro. Vernon Swift as the Presiding High Priest… Bro. Vernon Swift was appointed the Presiding High Priest by a vote of 17 to 16.” The law of God on calling and ordination to the priesthood has always been, “no man taketh this honour unto himself, but he that is called of God, as was Aaron.” (Heb. 5:4) Aaron was called by prophecy through Moses, who held the authority to ordain him. James explained that “called of God, as was Aaron” means that a person must be called by the mouth of one holding that priesthood; and ordained by one holding at least that high an office. “In order to being called of God as was Aaron, it is not necessary to be called by the mouth of a prophet, but by the mouth of any one who has the authority to ordain.” (Zion’s Reveille, Vol. 2, No. 12, p. 50/102) No person can legally call another to an office higher in the priesthood than that which he holds. James taught the vote of the people is not the voice of God. The act was null and void not only due to the manner in which it was administered; it was also null and void because Wingfield Watson could not be ordained a Presiding High Priest. Since L. D. Hickey could not stand at the head, he could not appoint another to such an office. The stream cannot rise higher than its fountain. James J. Strang taught that whatever act or ordinance is required to place any person in a particular office of the priesthood is required of all. High Priests during the administration of James were required to attend a general conference of the church to receive their various appointments and jurisdiction as Presiding High Priests. 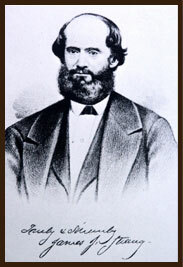 Don Carlos Smith was called by the High Council and ordained by President Joseph Smith, Senior, and Sidney Rigdon, Counselor. He had to be ordained to ruling authority through those that stood above him in royal (presiding) priesthood. Bruce Flanders had been ordained by Joseph Mead to the office of High Priest a week before the 1955 General Conference. His ordination was ruled invalid and he was re-ordained. At the 1965 High Priest Conference, the ordination of Jared Flanders to the office of high priest was ruled null and void; because he had not been called to that office by a general conference. A major problem arises by declaring this verse to be in force. If it was in force in 1955, it was in force from the time the law was first established. This ruling, if true, declares the ordinations of Samuel Martin and Lloyd Flanders to be invalid. Section 20, verses 65, 66, and 67 were not part of the revelation given to Joseph Smith in April, 1830. It must be remembered that these men were trying to do their best, according to their understanding. Wingfield Watson, Samuel Martin, Moroni Flanders, and Lloyd Flanders did a great deal of ministerial work; and should be honored for their work. Even though they may have erred in their understanding of the order of the priesthood, they must be honored for their good work in the gospel. It has been noted that they were High Priests with evangelical duties; and were only blessed to help guide the people in their spiritual affairs. Their priesthood as High Priests was valid; and the ordinances they performed were legitimate. Those whom they ordained according to the law of God had a legitimate call to the priesthood. All priesthood is valid until regularly taken away. King David had committed murder in the death of Uriah. He repented in tears; and David was still recognized as a High Priest and King. He could not receive forgiveness in life for such a grievous sin; but, his priesthood was still valid. There seems to be only three cases where men have attempted to actually stand as a ruler over the church. First, Wingfield Watson, Albert Ketchum, and John Flanders made such an attempt in 1919. It was soon recognized as an error and abandoned. Samuel Martin, Moroni Flanders, and Lloyd Flanders understood they were High Priests with evangelical responsibilities; and had no ruling authority over the church. The second was under Vernon D. Swift who was barely voted into that office by the calling of a teacher and a vote of the people in 1955; and was not presumably ordained until over three years later. Swift appears to have been the only one that considered himself as a ruler of the people. The third is addressed below. The main stream members of the Strangite church elected to organize themselves as a corporation. At the 1961 General Conference they accepted the Certificate of Incorporation and the Constitution of the Church of Jesus Christ of Latter Day Saints (Strangite) [Inc.]. When a group organizes themselves as a corporation, they lose their former identity. The church had two identities: one civil and one spiritual. Had the church incorporated only the civil (e.g. properties) part of the church as a corporation, they could have retained their original spiritual identity. Instead, they incorporated the spiritual identity of the church as a corporation; and thereby lost that spiritual identity. They simply became a part of the US Government; as stated on the Certification of Incorporation. In 1961, under the leadership of Vernon Swift, many of the members organized the spiritual identity of the church as a corporation. The Certificate of Incorporation made it clear this new church, “has absolutely no connection, ties, agency or affiliation with any other religious society;” including the original unincorporated church founded by Joseph Smith and continued through James J. Strang. The name of the corporation is THE CHURCH OF JESUS CHRIST OF LATTER SAINTS (STRANGITE). As a church of man it now had no association with the church organized by Joseph Smith and continued through James J. Strang; including no authority to preach or administer the saving ordinances of the gospel. It is simply an appendage to the US Government. A provision in the New Mexico Statutes allows them to use the name without appending the “Inc.” This does not change their actual identity. They are a church of man and have no claim to divine authority. Their acts are simply those of the US Government. They are now only acts of man. Their ordinances are not recorded in heaven. Vernon D. Swift was stripped of any ruling power by the adoption of the corporate bylaws, “THE CONSTITUTION OF THE CHURCH OF JESUS CHRIST OF LATTER DAY SAINTS (Strangite).” The church organized by Joseph Smith under the law of God never recognized any group of High Priests to stand at the head of the church. Even the quorum of three Presiding High Priests that constituted a quorum of the Presidency had no ruling power over the church. Let them be ruled by their own words. There conferences and actions have utilized the corporate Constitution. At the 1968 General Conference, “Bro. Vernon opened the Conference by calling attention to the Constitution of the [corporation] church, especially pointing out Article III, Section 1, Paragraph G., stating that the High Priests who met prior to the Conference to act as the resolutions committee must be considered by the Church as a Council of High Priests.” Wrong! Their constitution requires a “majority” to act as the Council of High Priests. In 1965, they noted, “Due to the LACK OF A QUORUM… The high priests could not agree on their authority.” In 1967, they noted, “we must have eight to have a majority… We had six.” In 1969, they never recognized themselves as a majority of the Council of High Priests. In 1975, “The HIGH PRIESTS now taking part in Church matters ARE ACTING AS AN ADVISORY GROUP… WE DO NOT CONSIDER THE HIGH PRIESTS in the Church, at this time, TO BE A HIGH COUNCIL.” In 1985, they did not sustain themselves as a majority of the Council of High Priests. In 1993, they did not sustain themselves as a majority of the Council of High Priests. Vernon D. Swift noted, “we did not agree on the things discussed.” From the 1961 General Conference that organized the corporation church to the 1993 High Priest Conference, the church was without governing authority. This new corporation church was to be governed by a new man-made order of the priesthood; established to “constitute the government of the church.” Vernon was never able to get a quorum to act as this Council of High Priests until sometime after 1993. No quorum of High Priests was ever recognized by the law of God; as having ruling authority over the church. Ruling authority over the church was limited to the Presidency and to Presiding High Priests ordained by the Presidency. The corporate by-laws of this corporation “shall govern the administration and regulation of the affairs of the corporation [church].” In fact, this Constitution was used to govern the corporation church; as early as 1963. It was used in every conference; and in every church action. The only reasonable conclusion is that this church exists only as a part of the United States Government. The spiritual church under Joseph Smith and James J. Strang was never incorporated. There is nothing in the law of God that requires a person to join a civil corporation. We have been instructed not to join other churches and not to organize any new churches. The gospel of Christ is as unchangeable as all spiritual truth. Allegiance should be pledged only to God and not to man. The original church organized by Joseph Smith was the Church of Christ. Its name has been changed several times; but, until the death of James J. Strang its organization remained the same. Although the church today would most appropriately be called the Church of the Latter Day Saints, regardless what name is used, they represent the remnant of the original church. The corporation church split from the original church; and exists only as a fictitious entity–part of the United States Government. A remnant of the original church, organized by Joseph Smith, remains today. They do not accept membership in the corporation. The problem with having their names removed from the corporation membership list rests with Vernon D. Swift combining all followers of James J. Strang, who he considered acceptable, into one list. There are far more members and officers in the original unincorporated church today than exist in the corporate church. The corporate church is slowly dissolving into the world. As long as one person is left holding a valid claim to the Melchisedec Priesthood, there is divine authority on the earth to preach and administer the saving ordinances of the gospel. The greatest opportunity ever given to man remains available—the approbation of eternal life. Man must always decide whether he prefers the will of God, His law, and the testimony of His holy prophets or the teachings and traditions of man and the pleasures of the world. “How are the sins of the saints forgiven? By confession. ‘If we CONFESS our sins, he is fruitful and just to forgive us our sins, and to cleanse us from ALL unrighteousness.’ To whom are sins to be confessed? ‘Confess your FAULTS ONE to ANOTHER, and PRAY one for another, that ye may be healed.’” (Zion’s Reveille, Vol. 2, No. 8, p. 30/82) Forgiveness is the result of confession, repentance, and recompense. The members of the corporate church could follow his lead, dissolve the corporation, confess of their error, repent of their sin, and the Lord is merciful in His forgiveness. I pray for them; but, I fear they will be counted among the five foolish virgins (Matt. 25); and will be left behind when the trump is sounded. We are commanded to, “Study to shew thyself approved unto God, a workman that needeth not to be ashamed, rightly dividing the word of truth” (2 Tim. 2:15 ); “Prove all things; hold fast that which is good” (1 Thess. 5:21); and “To the law and to the testimony: if they speak not according to this word, it is because there is no light in them” (Isa. 8:20).